When I set out to write my post Things I'm Afraid To Tell You a few weeks ago, I had no idea that it would become my most popular post ever. Who knew that after two years of blogging all you really wanted was to hear me vent? 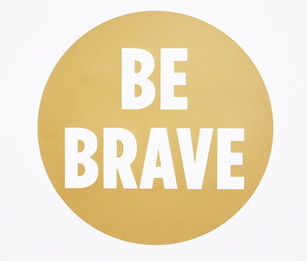 It's incredible to see how far such a movement can spread through the blogging world, the Huffington Post even wrote about it and I completely fell in love with this 'Be Brave' print by Jess Constable, who originated the idea. Now there are people all over the world displaying real bravery so let's not take ourselves too seriously. I mean telling you all I have a fear of regret is one thing, pulling someone out of burning building or braving an illness is another. But by all means be brave, go ahead and blog about your fears - I did and it felt amazing. Hey Jaclyn! So glad you found my blog, and I'm so glad to have found yours! I love your writing style/voice - so witty, funny and inspirational! Can't wait to read more.